I started fishing in 1970 moving onto Carp in 1977. I have always made my own bait. In the 1980's most of these were milk protein baits. From 1990 I have used fish/birdfood milk protein baits almost exclusively. In 1992 myself and a friend put together what is now Red Baron. In 2000 I started to get approached by anglers to roll baits for them as I was having good results on the water that I fished. I formed Custom Bait Services in 2002 selling Red Baron and multi-meat boilies. I expanded the range in 2004 with one of the first nut mixes to hit the market. In 2006 testing began on a stepped up version of Red Baron. The first bait to come from this testing was The Secret Peach and Pepper, this was released in 2008. Further testing followed with a tweaked base mix and high levels of natural attraction, plus a new spice blend. Fenland Spice Specials were released in 2011. Further bait development is ongoing. I fished local waters to me from 1977 to 1999 catching lot's of 20's and a few 30's. In 1999 I joined the Dovecote Syndicate in Bucks. I spent 6 years on there catching fish to 38.8lb. I have been a member of the fantastic Bundy's Pit near Peterborough since 2006. I am also a member of the Mangrove. I have caught 55 fish over 30lbs in England with a PB of 46.6lb. 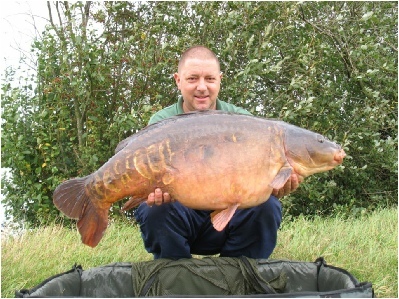 I also fished the little Irchester Syndicate in Northants catching fish to 39.08lb.